When the Thames Hospital 150 Commemorations were held in November 2018, a common memory for many was 'dishing up' the patients meals. The great stainless steel trolleys that the hospital orderly delivered around the wards. Chaos would reign if they were early or late! Ready or not the patients' needed serving. Trays preset for the appropriate meal, plates warming, the ritual would begin. Either dished up in the main kitchen or the more adventurous would push the great beast around the ward - many a plate broken along the way. The Ward Sister would preside over the midday meal, assisted by another who got to dish up the vegies and / or desserts. 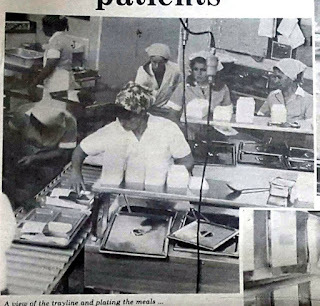 Many were horrified the day this system changed to pre-prepared trays, where patients completed their menu choices in advance. 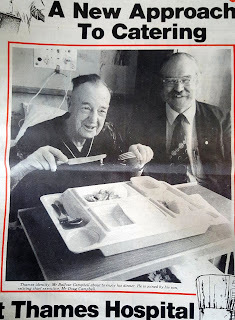 The True Tales of Thames Hospital has many a related tale about meals at Thames Hospital as well as articles by the late Doug Campbell who was Chief Executive at the time of the change 1981-82. 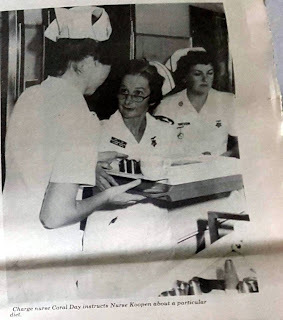 When the meal delivery system changed, the impact was felt in many areas - physical changes and duties in the kitchen; wardsmaids and nursing staffs duties also changed. Compartments of food in a big tray, to be dished out and collected, with no washing of utensils/plates in the ward. 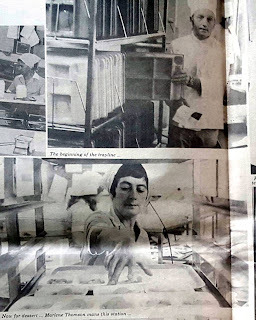 The newspaper featured a major article on the change which thankfully was discovered in the late Doug Campbell's vast collection of hospital memorabilia. On the right is a photo of Doug when the change took place, and fittingly, with his father Mr Balfour Campbell who was a patient at the time in Thames Hospital. 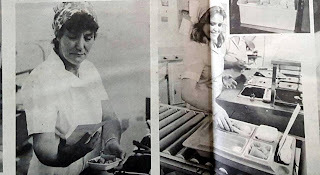 ABOVE: Kitchen staff busy on the trayline, preparing the food portions, before loading them into the tray and to the large trolleys for delivery to the wards. 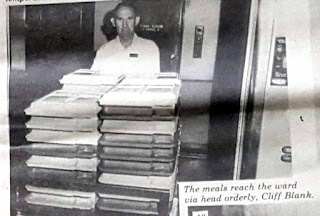 BELOW: Final menu checks and additions, the the food trays were ready for delivery. ABOVE: Charge Nurse Day checks the meal before it is taken to the patient by Student Nurse Koopen. 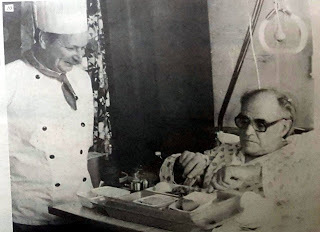 Right: The Hospital's chef checks a patient's meal at the bedside. Was the change popular? Memory has it that there were teething problems. Things to do with menu selection, temperature of the meal and managing the big tray. Some liked it from the start, others not. It was a loss of one of those special touches, where you as a nurse could give the patient the amount and what they liked, and yes seconds for those that wanted more! Plus no more 'sneaking' into the kitchen to see what leftovers remained!!! An unexpected loss, was patient's sadness at losing their traycovers, which used to be placed on the old wooden trays. Many a patient took these home as a souvenir. A sample below. 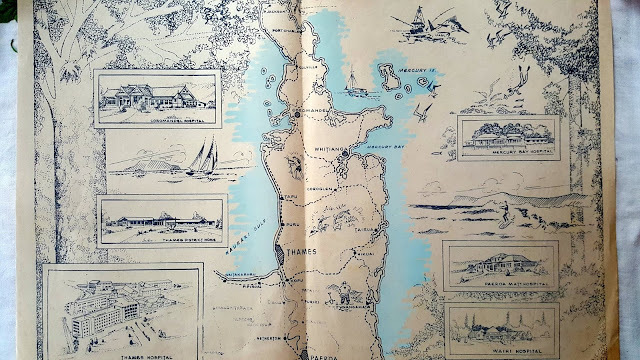 IT featured the hospitals run by the Thames Hospital Board: District Homes, Coromandel Hospital, Mercury Bay Hospital, Waihi Hospital, Paeroa Hospital and the base hospital at Thames. When the 150th Commemoration Dinner was held, the traycover featured on the place-mat, so got to be showcased one last time! Thames Hospital Board Tray Cover used pre 1982.